Whilst planning and designing Moregeous Mansions, I’ve been collecting old metal with the idea in mind to somehow melt it down and use it for furniture, combining it with the lumps and chunks of timber we have stored and drying ready for use post-build. I’ve seen lots of timber plus resin or timber plus glass combos recently, but wanted to create a wood / metal mix, in a very rustic yet modern way. A huge smile appeared across my face when I saw this wonderful collection featured on the Dezeen design site yesterday and realised it is possible and wow, isn’t it amazing, but of course a little ‘doh’ as someone’s gotten there first. 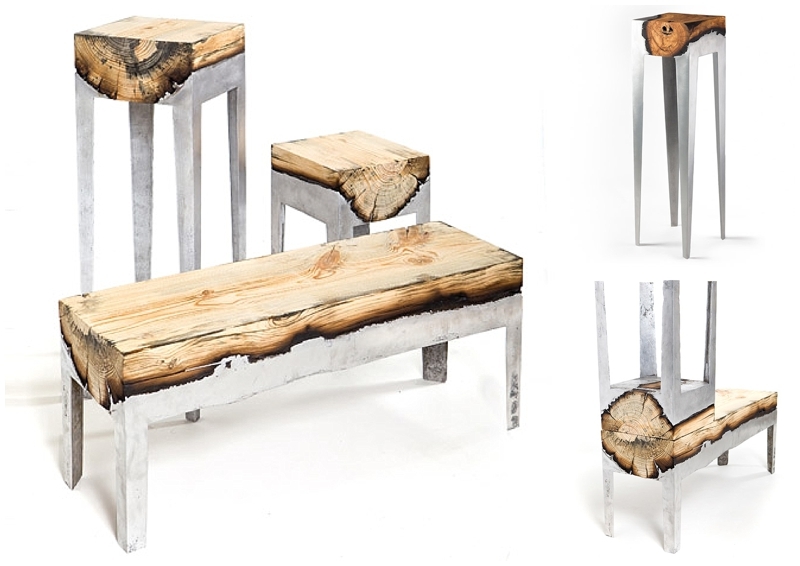 Tel Aviv designer Hilla Shamia has successfully fused molten aluminium with split and dried tree trunks to make these rather gorgeous pieces of contemporary seating. I’m totally inspired and determined to do something with all that copper and lead I have squirrelled away. Roll on Spring when our build will be finished and I can start getting creative! Do Up Diary #45 Leak begone! Let’s have a New Year and a New House! God, I love these! Wish I could try and make something like this!